This is an insightful book for those who want to learn more about different types watercolour brushes and the marks and textures they can make. 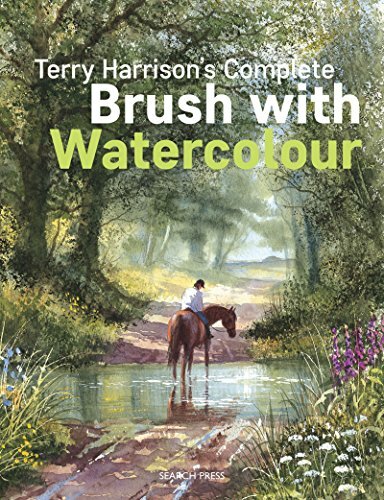 This is a very hands-on book with exercises that you can easily follow along as Terry Harrison goes through the different types of brushes. You do need to have some of the brushes used in the book in order to follow along. There are 12 brushes mentioned. Some are similar brushes but differ in size. The standard round brush is included of course. Other brushes include rigger, stippler, fan and a few more. In addition to the short tutorials on how you can create textures with those brushes, there are also 10 full length step by step tutorials that show you how a painting is completed with the use of different brushes. The shorter tutorials only focus on showing one brush at a time. This is a helpful book that lets you understand the characteristics of different watercolour brush, and how to best make use of them.